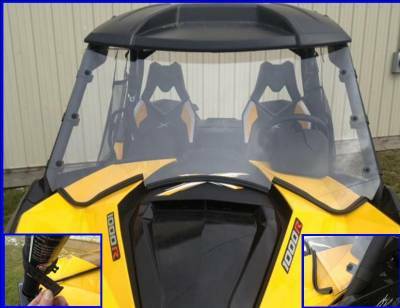 Can-Am Maverick Full Hard Coated Windshield Fits: 2013-16 Maverick and Max. Includes: X DS Made from 1/4" Thick MR-10 Hard Coated Lexan (polycarbonate). DOT Rated-AS5 etched with our logo on the drivers side. EMP Logo Etched on lower drivers side is required for DOT Rating. Hard Coating on both sides (not just one side like others on the market). Gasket along the bottom protects and seals along your hood. EMP Logo Etched on lower drivers side is required for DOT Rating. Includes: (6) Rubber "Fast Straps" Fits: 2013 Can-Am Maverick Made in Cleveland, Ohio. Made from 1/4" Thick Hard MR-10 Hard Coated (both sides) Polycarbonate (Lexan). This may be the best windshield on the market. Attaches with our Patent Pending "Fast Straps" windshield fasteners so it can easily be removed in seconds without any tools. Rubber gasket protects and seals your hood. Does not crack like less expensive acrylic.